Why Demand Huge Wildlife Hazard Zone for Pickering – But None for Island Airport? A person must not use, or permit another person to use, any of the lands described in Part 7 of the schedule for activities or uses that attract wildlife — particularly birds — that may create a hazard for aviation safety. vast expanses of farmland, watersheds, and natural habitat well outside the RNUP boundary. No owner or occupier of any land to which these Regulations apply shall permit that land or any part of it to be used for the disposal of any waste that is edible by or attractive to birds. 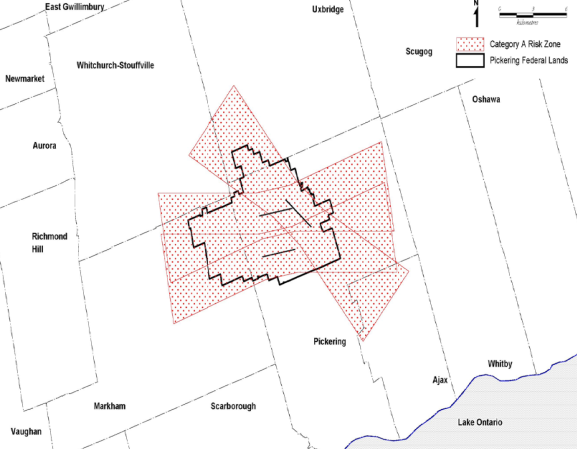 The Research Report includes this illustration of the huge Category A Risk Zone contemplated for Pickering Airport – Category A is described as presenting risk of catastrophic loss, measured as either the complete loss of the aircraft or the loss of more than one life as a consequence of a bird strike event. CommunityAIR asks Transport Canada to explain its differential treatment. Why is the presence of thousands of the large birds on Toronto’s waterfront ignored, when severe constraints on wildlife are insisted upon for the proposed Pickering Airport? Can it be that Transport Canada is ignoring safety issues at the Island Airport for political reasons? Or, will drastic measures to curb Toronto waterfront wild fowl be taken, especially if PorterPlans’ CS100 jets are permitted? Does Transport Canada have similar plans for Toronto’s waterfront?